From the Peccatte head to the silver mounting, this bow is the picture of refinement. Fast and responsive. Bows from the Jean Francois Nacovier workshop are our most popular, serving the most demanding advanced students and serious amateurs. In the tradition of the great French archetiers, we are proud to offer these impressive bows of fine character and outstanding playability. 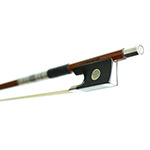 For the violinist seeking a strong bow with very warm sound, excellent control and fast response, but without breaking the bank, look no further! 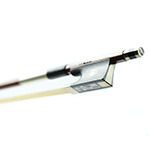 Easily comparable to European bows costing twice the price, these master bows are from the finest workshops in China. The antique finish of the fine pernambuco hints at the playing characteristics of the sophisticated bow. Firm stick imparts a warm sound for demanding passages. 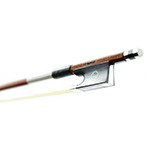 Bows from the Jean Francois Nacovier workshop are amongst our most popular, serving the most demanding advanced students and serious amateurs. In the tradition of the great French archetiers, we are proud to offer these impressive bows of fine character and outstanding playability. For the violist seeking a strong bow with very warm sound, excellent control and fast response, but without breaking the bank, look no further!